I call this my lazy hot Sunday noodles. “Lazy” because it is very easy and quick to make. And “hot,” well, it’s a bit of a misnomer since the dish itself is cold. But I usually crave it during “hot” summer days. And “Sunday” because that’s when I usually make it. If you are feeling a little more ambitious than I usually do when the weather/heat is stewing everything in its path (FOURTH heatwave of the summer, can you believe that?!!! ), you can stir-fry or sauté one or two of the items for a difference in texture. I’ve been just crazy about zucchinis lately. So I sauté it for literally a minute to wilt it a little with a pinch of salt. But really, all of the veggies can just be thrown into the noodles raw, just sliced thinly or julienned. But I do like to add some instant pickles made of cucumbers and/or daikons. It’s so easy, if you have the ingredients, you really should give it a try. It takes – maybe a minute extra, if that – of active “cooking” time. Additionally, I love to add scrambled eggs to the noodles. Usually, half of a boiled egg is added to each bowl of noodles. But I don’t really see the point of this. Do I eat it at the end? Do I crush it up and mix it with the noodles? I do neither because it doesn’t do much for the taste. But fluffy scrambled eggs on top added at the end? Yum! The contrast in temperature and texture is really heavenly. But don’t take my word for it. Try both and see which you prefer! If you choose to use pickled cucumbers, prepare them in accordance with the instructions below. Stir together all of the ingredients for the sauce. Prepare the noodles according to instructions. Once cooked, rinse the noodles in cold water until the noodles are cold. Drain. A few ice cubes can be added to the colander to keep noodles cold. Divide the noodles into two bowls. Divide the toppings of your choice between the two bowls. Mix well. If you choose to use scrambled eggs, add them to the bowls and mix gently. Enjoy!!! *Note: You can pick and choose your toppings. You can use other vegetables as well. Shredded red cabbage and/or julienned jicama are among the possible alternatives. And if you choose to use pickled cucumbers and/or radish, recipe follows immediately below. And as with other recipes, you can adjust the sauce according to your preference by adding more gochujang, tamari, or vinegar. But try the original sauce recipe first before adjusting. 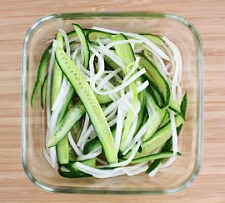 Add the salt to the cucumber and daikon slices. Toss to distribute the salt. Allow it to sit for five minutes. Stir together vinegar and agave nectar (or honey). Pour the mixture over the cucumber and daikons. Toss well. Cover and place it in the refrigerator until ready to use. Really! That’s it! If you don’t have daikons, just use another cucumber. If you use the pickles, you can forgo any additional julienned cucumbers. Wow, this looks amazingly delicious. Stunning photos too! Thank you!!! It’s pretty yummy. And you can put in just about any vegetable that can be julienned or shredded! This looks healthy and divine! Thanks Angie! It’s super healthy & thankfully easy to make! Yum yum yum!! My family actually had “mix-everything-bibim-guksu” with leftovers today! This looks great too! We do that too! After a big party when we have a ton of namul left over, we mix everything in to bibim bap or bibim guksu! 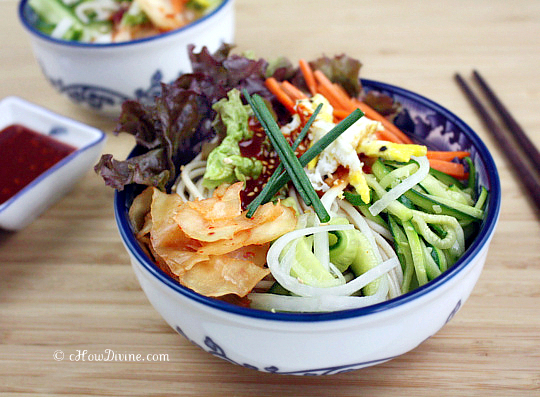 Bibimguksu is one of my favorite things ever! Yours looks colorful and delicious! Mine too! It’s so yummy, especially on hot days! the cold noodles look amazing. 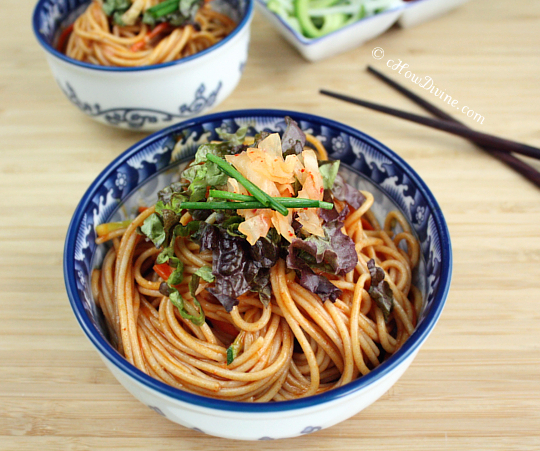 I am a huge cold noodle fan and I’ve also been looking for new cold noodle recipes to try. This one is definitely added! I’ve got a bowl like those as well. Love the pattern! Thanks Yi! I’m a noodle fanatic myself – hot or cold. And I got these bowls because of the pattern and the color combo! Seriously, I am so so loving all your recipes. We recently built a house and are living on borrowed electricity (of aforementioned inlaws, not illegally LOL) until next week when the electric comapny can come out. But man when they do, I am seriously cooking my way through your entire blog. 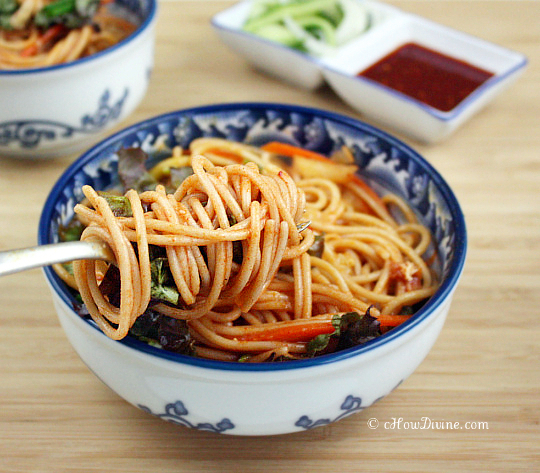 These noddles are on the top of the list. Yum! So excited! Thanks so much Tricia! I get really excited about food as well. But wow, a newly-built house. Now, that’s exciting! I made this tonight! 🙂 I never had bibimguksu before, just bibimbap. This was very spicy and refreshing! I didn’t have to ingredients to make the pickles, but next time I will try it for sure. Thank you for the recipe! Delicioussss!! Thanks Nat! I love this dish in the summertime – although I also eat it in the winter. 🙂 It’s so refreshing. I’m glad you liked it too. You should definitely try the pickles. It adds a different layer of flavor to the dish. Happy Friday! Another ‘definite-try’ on these hot summer days! OK, now for my question… fall is closing in quickly (although it does not feel like it) and i have a special pair of of farming gals that love pickled daikon… so much in fact, they are growing a ton to be pickled this year! The only pickles I have made, and what got them hooked, was a twist on a Food Network recipe (Tyler Florence’s) which I cut back on the sugar a bit, added some chile and garlic to the mix and turned out very well. However, I am wanting to do more fermented pickles this year – my Eastern European heritage has me working on fermented garlic-dill cucumbers, already in the crock and waiting on cabbage for me some sauerkraut. But after trying your marvelous baby bak choi kimchi last year, I am now a believer in Korean pickled veggies! So to my question – can you point me to a trusted resource for fermented pickled daikon recipes ? Or would you divulge grandma’s secrets? Maybe I missed something you already posted…? Stay cool… and many thanks in advance! I hope this helps. Hope you have a great weekend!